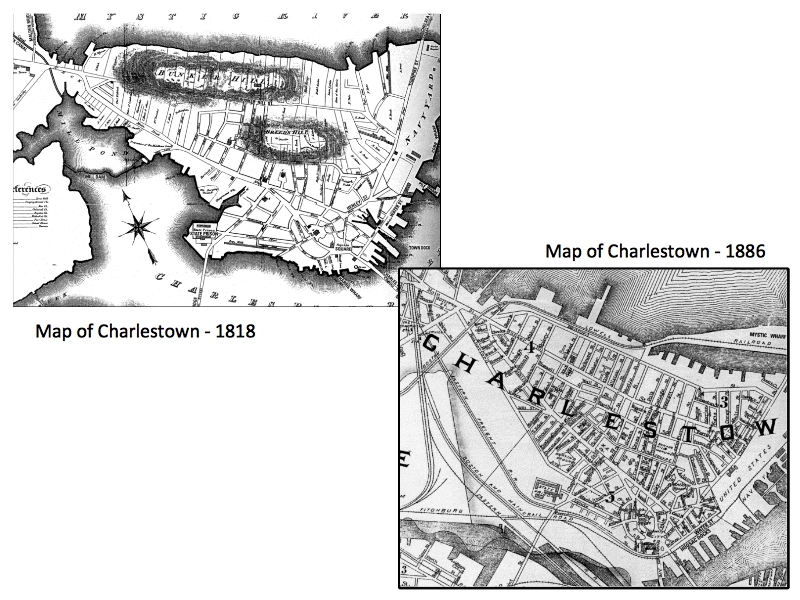 Well known as the home of Bunker Hill and Breeds Hill, when Charlestown was first occupied by British colonists, it was surrounded on nearly all sides by water. Only a small strip of land called the “neck” connected what is now Charlestown to Somerville and Cambridge. Beginning operation in 1802, the Middlesex Canal connected Boston to the Merrimac River via a waterway (see canal route in top left corner of 1818 map). What is Rutherford Avenue today was initially a tow path along the canal. The Charlestown State Prison, built in 1805, can be seen on the water’s edge adjacent to a bridge leading to Cambridge. By 1886, the millpond and water between Charlestown and Cambridge had largely been filled in and the canal was disbanded. However, the area’s role as a transportation link can be seen by the multiple railroad lines that crossed the area. The Charlestown State Prison remained , now surrounded by rail lines and industrial activity. By 1901, the Charlestown “Elevated” or “El” connected Everett and Charlestown to Canal Street in Boston. In front of the station was a plaza and fountain. Homes and businesses lined two sides of the plaza and surface level street cars connected directly to the train inside the station. The El traveled from City Square to Sullivan Square along Main Street, passing by the Schrafft’s candy factory. Little of historic Sullivan Square remains visible today. By the early 1950's, a traffic rotary was built, along with a multi-lane vehicle overpass that flew over the rotary parallel to the elevated train tracks. An underpass led to the Alford Street bridge. In 1975, the El ceased operation and the station and plaza were demolished, replaced by the parking lots and storage buildings that remain today. In fact, only a few of the buildings visible in the 1929 photo remain. The red dot is the three story building that has the vacant “R Wesley's” bistro on the ground floor and the yellow dot is the church at the corner of Cambridge Street and Rutherford Avenue – adjacent to one of the most precarious spots for pedestrians today. Before it became the home of the Bunker Hill Community College, the corner of the Prison Point Bridge and Rutherford Avenue was home to the Charlestown State Prison. Built in 1803, it was condemned in 1878, but reopened six years later because it was needed to alleviate overcrowding elsewhere in the prison system. Rutherford Road can be seen along the right side of the photo of the prison. At the time, it was only 1 lane in each direction and had a large bend or “dog leg” in it. South of this point, traffic wove its way through the Charlestown neighborhood on Old Rutherford Avenue causing great congestion for hours each day. 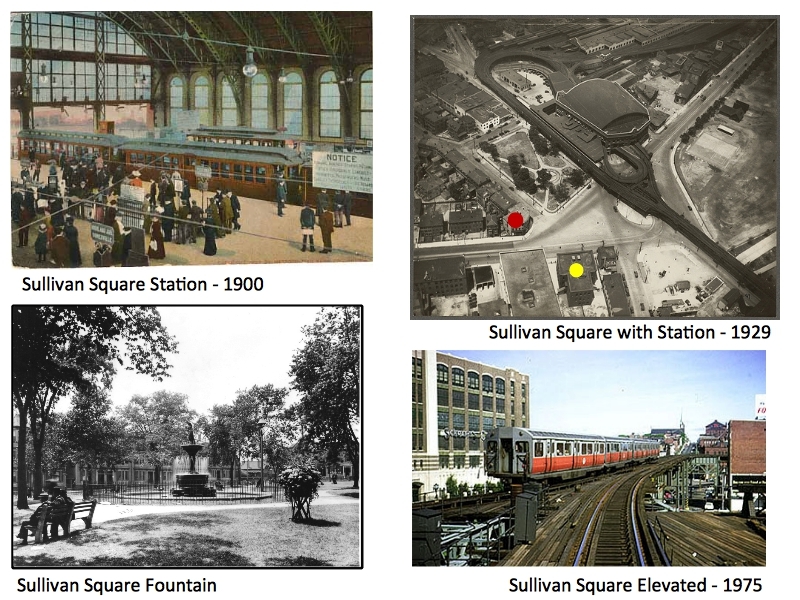 Ten or so years after the Sullivan Square rotary was built, advocacy by Charlestown residents, Legislators and Governor Foster Furcolo led to the realignment of Rutherford Avenue between Austin Street and City Square and its expansion to 10 lanes. At the same time, the Bunker Hill Community College was built on the former site of the Charlestown Prison. City Square has undergone significant transformation over its lifetime. 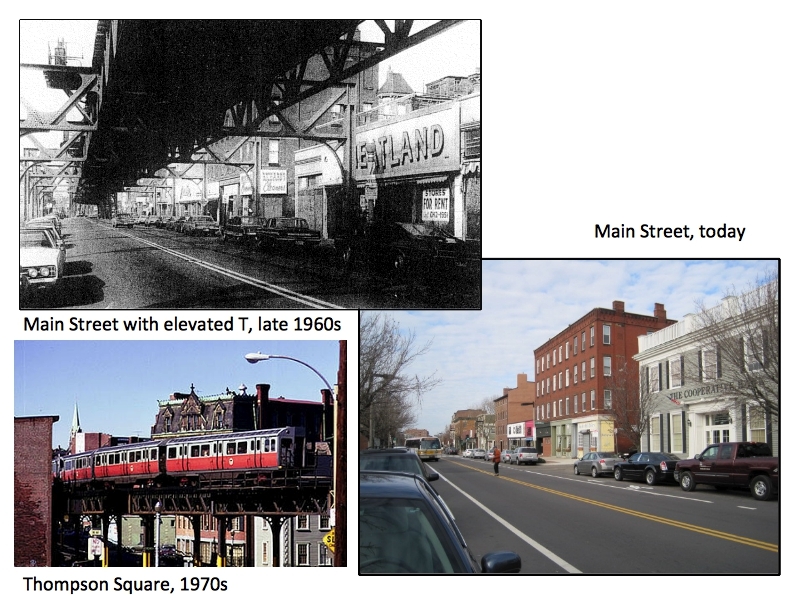 Once a pedestrian friendly area with a circular park and the home of Charlestown’s city hall, it was transformed for the worse by an elevated T Station and tracks built in 1900 and overhead ramps from the Tobin Bridge built in 1950. Prior to the removal of the El, City Square was a major bus depot serving the inner suburbs. The entire City Square area was dark, dank, and very dirty, with masses of pigeons and major traffic congestion. Fortunately, in the 1970's, when Big Dig planning was underway, a group of Charlestown residents lobbied to have the Tobin Bridge on and off ramps put underground. As a result of their efforts, City Square has come full circle and is one of the most favored spots in the neighborhood. The El had a devastating impact on Main Street. 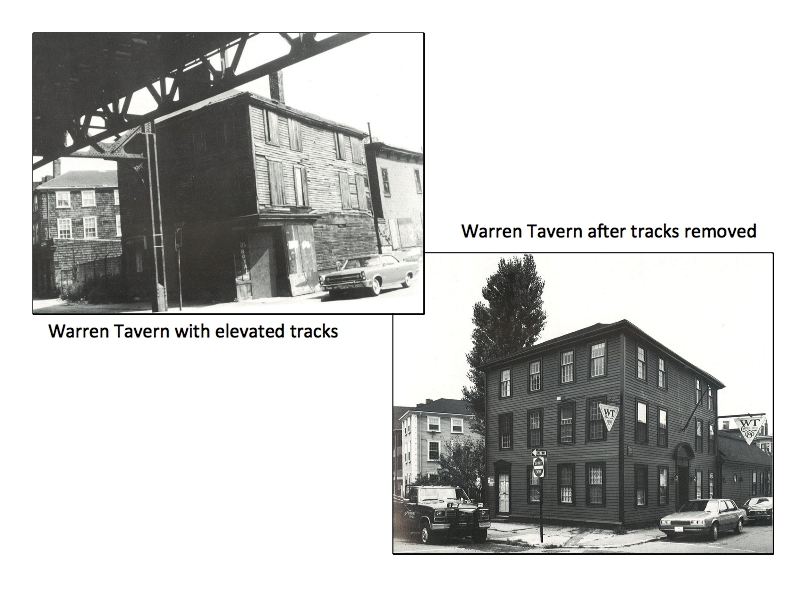 These photos show a before and after of the Warren Tavern, a building once considered for demolition. Main Street has been transformed by the removal of the El.